contentACCESS is a modular product and its functionality is extended with plugins, which are intended to manage certain data management processes. The licensed plugins can be also customized and fitted to ones needs. To achieve this, it is necessary to create new jobs from an available plugin. A new job is created from a type of a built-in plugin, which is characteristic with its own configuration settings (scheduling, retention, database, storage settings etc.). These configurations assign certain data processing tasks to the job. It is possible to create countless jobs from the same type of a plugin. Each of them will have different configurations regarding the database where the processed metadata will be located, the storage where the processed binaries will be stored, the frequency of their running etc. and Custom plugins (all licensed plugins except of Email Archive and File Archive plugins are accessible here). To create a new job from any of these plugins, the administrator should open the Jobs page and here click on + new. Note: The “+ new” option (i.e. 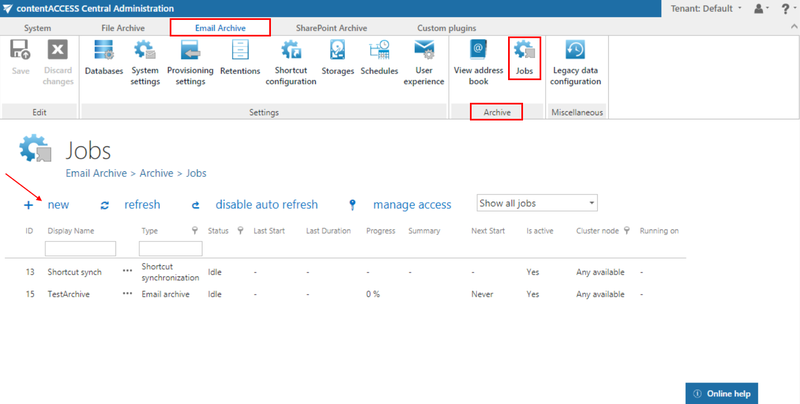 to create new job) is unavailable for the logged on user if the “Add jobs” permission on the tenant is not allowed in his role assignment. The “manage access” option allows to grant access permissions on the selected job for a second user. 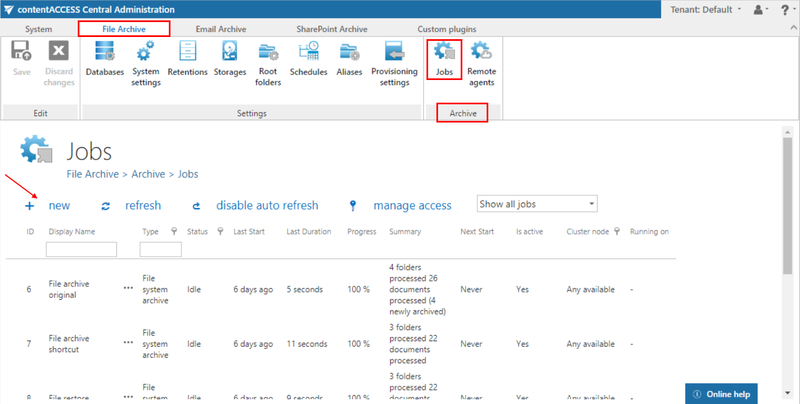 This “manage access” option is available for the logged on administrator if his role assignment contains the Edit jobs – All allowed permission on the tenant. Read more in Managing access to contentACCESS objects. Custom plugins ⇒ General ⇒ Jobs (for the Custom plugin type). On the same page, the user may refresh the status information of all jobs. This can be done either manually with the refresh button or by enabling/disabling automatic refresh with the enable/disable auto refresh button. 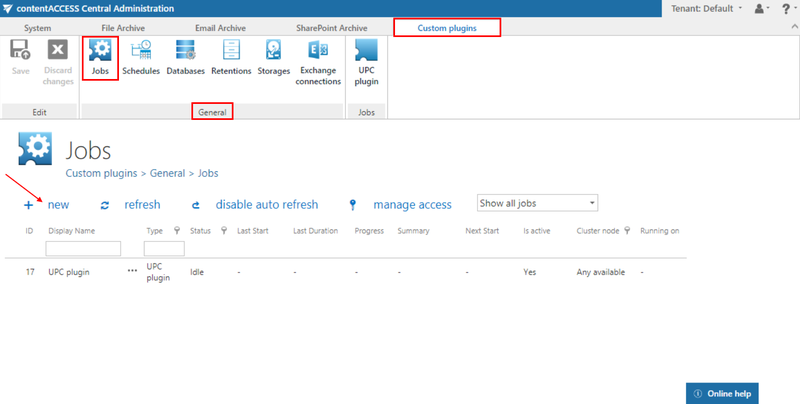 How to create new jobs: Open the Add new job instance dialog with a click on + new on the Jobs page. Select an available plugin from the dropdown list (the list contains only the licensed plugins). 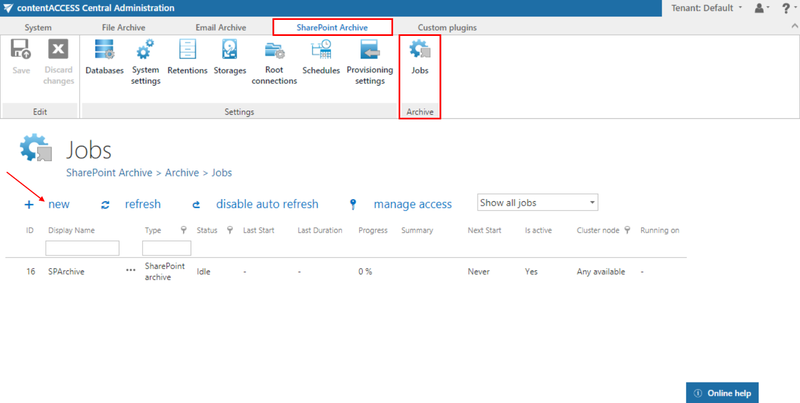 Open the Run on node dropdown list and select a node from the cluster, where the job should run. If you would not like to specify a node, select Any available from the list. Enter a Display name for your job. In the same window below you can read a very short description about the selected plugin type. Click on Add. A pop-up window will ask you if you would like to configure the newly created job immediately. By clicking on OK, the Job’s configuration page will be automatically loaded. 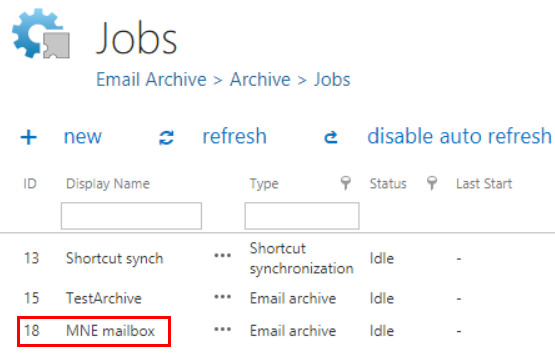 If you would like to configure the job later on, click on Cancel in this window. In this case the job will be only added to the list of jobs on the Jobs page (but will not run as it is not configured yet). Further information about configuring jobs in contentACCESS can be read in the respective subchapters.